The big event that we had been writing about and planning for over a month finally went down yesterday at Carpool in Arlington, Virginia. And I am happy to report that the DC Stogie Guys Cigar Smoke Out was a huge success. While we had hosted a few of these events in the past, yesterday’s Smoke Out was particularly fun because our friends at Cuban Crafters generously provided free cutters and cigars from their Cameroon line for all attendees. Based on what I overheard, I think it’s safe to say everyone enjoyed the sticks, which boast mild, woody notes and a typical Cameroon sweetness. But Cuban Crafters’ generosity didn’t end there. They also provided a three-finger black leather cigar case, a stainless steel cutter, a marble ashtray, and a 100-count humidor for us to give away in a free raffle. Stewart Cumbo, seen below, took home the grand prize. Thank you once again to Cuban Crafters for making the event possible, and thank you to everyone who joined us for a great afternoon of cigars and camaraderie. We look forward to seeing you again soon! Sounds like an absolute blast. I would have been there if I lived within 150 miles of DC. Looks like it was a ton of fun. I'm just sorry I couldn't be there! Next time for sure, though. Jon's right, it looks like it was a fantastic event. Maybe next time! I want those cigars! 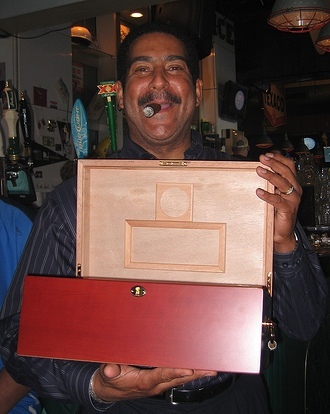 I want that humidor! I totally missed out! Thanks, guys! I enjoyed the cigars, and meeting the group at Carpool was a great Sunday change of pace. How about a Chicago Smoke Out?! Patrick and Patrick, you guys threw a great smokeout. 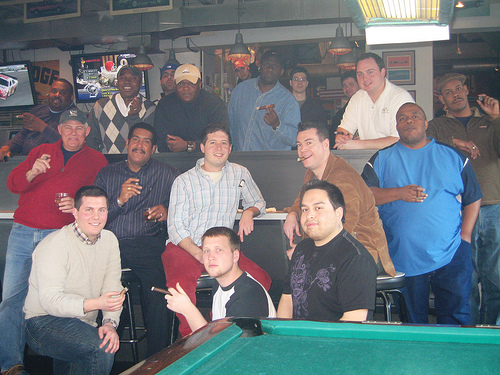 It was great to meet fellow cigar aficionados in a public place where you can still smoke! I enjoyed it very much and look forward to the next one. Thanks for the cigars and the cutter.